The 1968 Pro Bowl was the NFL's eighteenth annual all-star game which featured the outstanding performers from the 1967 season. 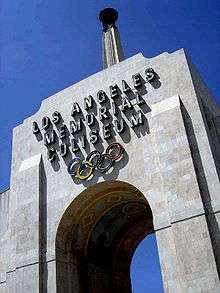 The game was played on January 21, 1968, at Los Angeles Memorial Coliseum in Los Angeles, California. The final score was West 38, East 20. Gale Sayers of the Chicago Bears was named the back of the game for the second year in a row and Dave Robinson of the Green Bay Packers received the lineman of the game honors. Attendance at the game was 53,289. The game had controversy because East coach Otto Graham of the Washington Redskins benched quarterback Fran Tarkenton in the fourth quarter. Some players questioned the benching of a player of Tarkenton’s stature in a charity game. The coach of the West squad was Don Shula of the Baltimore Colts, who won his second Pro Bowl in four years. ↑ "Defensive plays turn tide for West in Pro Bowl win". The Pittsburgh Press. UPI. January 22, 1968. p. 24. Retrieved January 19, 2012. ↑ "The 1968 Pro Bowl". Bolding Sports Research. Archived from the original on January 19, 2012. Retrieved January 19, 2012. "1968 Pro Bowl players". Pro-Football-Reference.com. Archived from the original on January 31, 2012. Retrieved January 31, 2012.